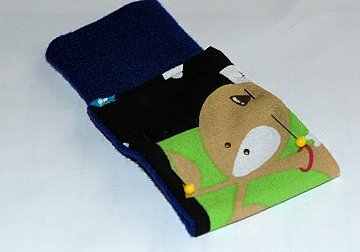 A simple ipod holder to sew. To make your iPod holder, doublecheck to make sure your Ipod will fit well in the dimensions below and change accordingly. 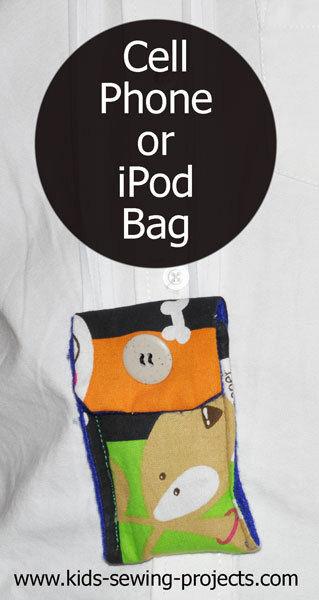 We have two different tutorials on this page that make great ipod cases. You will fold your rectangle 5 inches up leaving about 2 inches for the top flap. On the bottom 5 inches decorate however you would like. You can cut out scraps of different material and appliqué them on to your material. Or you can hand sew them on. Other ideas could be to add a trim with a glue gun or by sewing. Sew buttons for decorations. Fringe could also be used along the top edge. The ideas are limitless. This project can be a lot of fun because you can design it however you'd like. When you are done decorating fold up the bottom of your rectangle 5 inches. Sew two side edges. To finish hand sew two snaps to the top flap. Or cut a slit on the top flap and sew a button underneath. If you'd like a bright material then cut one piece the same size as your flannel rectangle. Place the right sides together and sew along the two long edges and one of the short edges. Leave the top open for turning inside out. Turn inside out. Iron flat. Turn top edge inside slightly and sew along top. Continue top stitching all along edges. Pin side edges together and sew. You can add a strap by sewing a piece of ribbon or cord to the sides. You can also add a button on the bottom flap and cut a slit on the top to fasten closed. Back to project index from iPod Holder.